Pure Esthetics Skin Analysis Assessment is a no-obligation consultation. Bring your current skincare products to find out what’s working for your skin and what isn’t! We offer a diagnostic assessment on your skin, delving beyond the superficial layers of the skin, to see what your skin is lacking and what the skin may need to get it into optimal condition. We will recommend the correct home care needs for your unique results and a treatment protocol to help correct any skin issues. 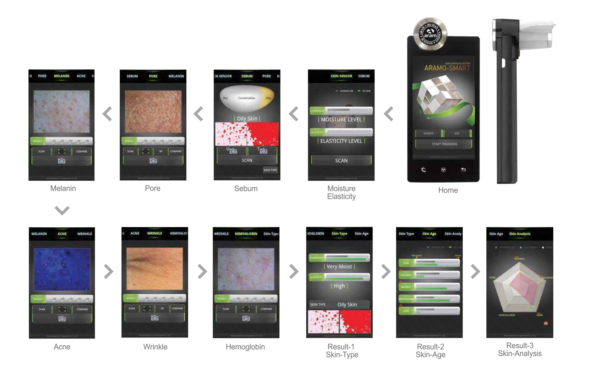 Your skin is not a guessing game and a detailed skin analysis with the APM 100 allows us to properly diagnose your skin. The APM’s technology enables us to see what is happening below the skin in order for us to work on an accurate treatment protocol with corrective homecare. We will do follow up assessments every 12 weeks or so as the results are measurable and we can see how the skin has improved. Please bring along any products you may be using, the medication you are taking as well as supplements as this all plays a role on the skin. Let us guide you to better skin. APM 100 measures the following in the skin. Hydration, Elasticity, Sebum, Pore, Melanin, Acne, Wrinkle Depth, Sensitivity.